I learned content distribution, syndication, and SEO very much by accident. Here’s the backstory: In 2005 I was firmly rooted in the world of documentaries. I worked on projects for ABC News, HBO, The New York Times and Frontline – always as a freelancer. I worked on films about terrorism in Europe, Abu Ghraib, Americans preparing for the apocalypse, and more. One of the Frontline programs, however, proved to be prophetic. I didn’t know it then, but The Secret History of the Credit Card would change the course of my career. Toward the end of my time in documentaries and TV, the work got a little weird. At one point, within the space of a month, I’d gone from producing episodes of Frontline for The New York Times to producing an episode of Wife Swap. I was getting married and needed a change. I also needed health insurance. Eventually, I saw an opening at the financial news site TheStreet.com and, based on my experience with the credit-card documentary, I landed a job there as managing editor of MainStreet.com, a new site focused on personal finance. The MainStreet editorial team was a fun, scrappy group, which was good because we were functioning as a startup within the company. We needed traffic and we were new, so generating awareness in a crowded personal finance beat was not easy. Over the years I’ve worked in personal finance for a variety of media organizations, big and small, established and startup. Now I’ve started my own company helping businesses of all types develop editorial and content strategies that make sense. It should come as no surprise that generating awareness is just about everyone’s top goal. When I first encountered this strategy, it seemed like it was all about eyeballs and traffic. Getting one of your articles featured on a big news portal’s home page carousel meant that millions of people would be exposed to your story and learn about your brand. More importantly, getting an article featured on the home page of a big web portal could lead to what is often referred to as a “fire hose” of traffic, with tens or even hundreds of thousands of people hitting your site over the course of hours or days. 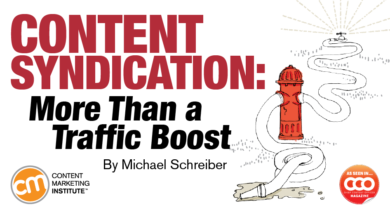 Scoring that fire hose of traffic was often considered the big win in the world of content syndication, but over time as I moved into different editorial roles, I learned that direct traffic was just the tip of the iceberg. Traffic from syndication partners is inherently spiky – there’s often no way to predict when your article will get prime placement on a site you don’t control – and prime placement (like the home page carousel, for example) is the key to getting that fire hose of traffic. One day an editor at one of those portals may like one of your stories and share it with the world, and the next day they don’t and it ends up buried in a vertical that sees relatively little traffic. Regardless of whether those syndicated articles find the eyeballs or languish on pages unseen, one segment of the audience sees everything: search engines. Google, the dominant search engine, along with Bing and others, sees these syndicated articles on news sites with powerful domain authority, and, more importantly, sees the links in the articles pointing to articles on the syndicators’ home websites. Inbound links from authoritative news sites can signal that the target sites have strong content, and the articles are solid, trustworthy pieces about the subjects in question. Search engines may be more likely to rank these sites and those articles higher in their results, which in turn means more organic (aka free) traffic over time. While syndicated articles may be hit or miss when it comes to that fire hose of traffic, they are also potentially helpful when it comes to growing organic traffic to your website. That organic traffic, when managed well, can grow considerably over time and usually isn’t spiky at all. Now, there are some caveats. First, not all syndication partners give credit for the links to your website. They may code those links as “no-follow,” which essentially communicates to search engines that the links should be ignored. Secondly, Google and other search engines change their algorithms regularly, and the way they view syndicated content will likely evolve. In fact, earlier this year Google suggested that syndicating articles solely for the purposes of link building was inadvisable and provided a variety of best practices to avoid a penalty, including adding those “no-follow” tags to links. If I’m reading the Google tea leaves right, I get where it is coming from. Content syndication shouldn’t be all about link building. You need to be committed to investing in the creation of a strong editorial team, because you believe that, in the long run, search algorithms and fire hoses aside, great content – on your site or others – represents a powerful way to attract and interact with your audience. I spoke to Hajnen Payson, head of Trihon Media (an SEO consultancy), a former colleague and a friend who I consider a genius at all things search. We talk about this a lot, and despite recent or future search engine algorithm changes, he believes that syndication has real value. “In my heart I feel that there will always be value because in order to syndicate to a real news site, your content has to be really good,” says Payson. “Even if authoritative news and media sites were targeted by the search engines, I still think it’d be valuable. It’s all about getting your site out there and, through syndication, you’re exposing yourself to more people and sites that might share. It’s like getting great press on TV. Even though they are on TV and there’s no link that can be shared, those big hits often cause organic lift just by creating awareness. This type of syndication strategy was a tool used for a time almost exclusively by traditional news organizations. Small news sites in need of a bigger audience would syndicate to larger news organizations in need of more content. The larger sites would get solid, free content, against which they could sell ads, and the smaller sites would create more awareness of their existence, grow traffic which they should be able to monetize, and sometimes get the fire hose. Over the past several years, however, others have been getting into the game. One group is independent journalists and bloggers looking to build an audience for their own personal sites. Until a few years ago, Trae Bodge was the spokesperson for the couponing site RetailMeNot.com. E-commerce companies are learning the same lessons, though their challenge from an organizational perspective is more significant. It’s considerably easier for journalists to pivot from large media organizations, establish themselves as independent journalists, and convince news portals to syndicate them than it is for, say, an insurance company to do the same thing. But it absolutely can be done. In fact, many companies are pursuing this strategy, particularly in the financial news space. There are, however, some important things to consider if you’re working to establish a real editorial operation. First, news content must be original and editorially sound – especially when it’s syndicated. That means you need to hire real writers and editors with journalistic skills. Articles must be well researched, well sourced with real quotes, well edited and fact-checked. Third, be honest and up-front with your editorial audience about how you make money. It’s not enough to stay away from areas of conflict. You should incorporate an editorial disclosure into your site that explains how your business works. Don’t hide it. If you’re honest about how your company profits, readers are more likely to trust and share your content. Finally, be smart about what you link to. This is how you tell your audience and, potentially, search engines which pages on your site are most important. It’s also how you ultimately measure the effectiveness of this exercise. This doesn’t mean you should cram your articles full of links for which you want to rank, but if you have articles that are informative, useful, representative of your site, and, most importantly, truly relevant in the context of the syndicated article, then link to them when appropriate. Remember, ultimately you want some portion of your reading audience to engage with you in one way or another, and properly monitoring and optimizing this conversion funnel is paramount, regardless of whether the source of the traffic is referral, direct, or organic. There is no reason why commercial entities cannot support news organizations. There’s a long history of it in America. CBS News is owned by National Amusements. ABC News is owned by Disney. NBC News is owned by Comcast, and was once owned by GE. They all may have perceived conflicts, but they all adhere to editorial standards and practices. The strength of these standards and practices is what makes these real news sites and keeps their audiences coming back (though these days, in the era of supposed “fake news,” that’s getting harder). The irony here is that traditional news organizations have just as much if not more to learn from e-commerce companies. The existing model for digital news is based largely on CPMs or ad impressions: News organizations get paid, say, $2 for every 1,000 impressions of an ad on their site. These CPMs have steadily fallen over the years, which means that news organizations have had to diversify. They are exploring new revenue streams like e-commerce. In other words, instead of getting paid a small amount when someone maybe sees an ad, some news sites are getting paid much more when readers click on and buy a product from links on the sites. The New York Times recently bought TheWirecutter.com, which features editorially independent product reviews, for this very reason. (Check out its editorial disclosure if you want to see how to do it right.) E-commerce could very well be the key to saving the news business. It may be why Jeff Bezos bought The Washington Post … but that’s another story. Before we conclude, content syndication terms often are used interchangeably to describe different ways of paying or bartering to get your content seen by a wider audience. CCO Chief Consulting Editor Clare McDermott sums up how to differentiate them. Platforms like Outbrain, Sharethrough, and Taboola disseminate your content using recommendation engines – which are essentially small widgets placed at the bottom or right margin of an article that recommend further reading. A content creator pays a company like Outbrain to include its content in the widget, and in return gets a boost of traffic to its site. These recommendation boxes are labeled as sponsored, though the transparency of that labeling varies widely. Pricing is based on cost per click. In a syndication relationship, a content creator provides content to a media site, and the media site offers backlinks in return for the content. Some cases may involve a revenue share of the ads sold by the media outlet against the content hosted on its site, but most syndication deals involve no money. Syndication is an increasingly popular way for digital media companies to beef up their content without paying directly for its creation, and content creators like syndication for the traffic it drives to their websites. Sites like MSN and Yahoo are well known for using syndication arrangements, but even non-media companies like LinkedIn use syndication strategies that are built on a barter relationship rather than a paid relationship. In a licensing deal, a content creator agrees to provide content in exchange for payment – whether in a one-time arrangement or a sustained relationship. Different types of intermediaries help brands with licensing deals. A company like NewsCred acts as a clearinghouse for companies that need to access more content and are willing to pay for it. And content creators can use a licensing agency to monetize the content they develop. A version of this article originally appeared in the November issue of CCO magazine. Subscribe for your free print copy today. Michael Schreiber is an Emmy and duPpont award winning reporter, editor and producer. He is the founder Amalgamated Unlimited, a company helping organizations big and small develop content and editorial strategies that make sense. He's a contributing editor at Inc.com and a contributor at Forbes. He's worked at The New York Times, Frontline, ABC News, HBO, Credit.com, TheStreet.com, and was an adjunct professor at Columbia University’s Graduate School of Journalism. Follow him on Twitter & learn more about him on LinkedIn.